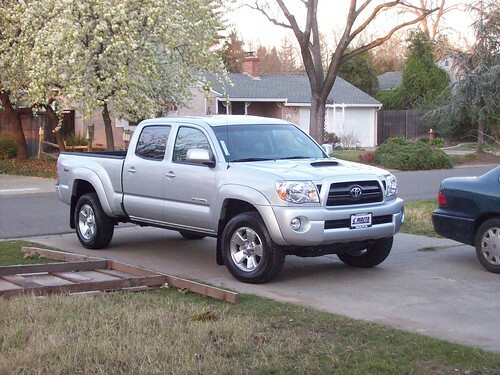 I haven’t gotten rid of the old truck. In fact, after watching the bonus features on [Who Killed the Electric Car? ][wktec], I’m thinking about converting it to an electric vehicle. I’ll need to pull the motor et al, anyway, so perhaps I can sell those “scrap” parts to help pay for the conversion. Our next problem was our clothes dryer. It’s been taking quite a while to dry the clothes lately–usually two full cycles per load. We checked everything we could think of, but we couldn’t figure out what the problem was. Last week the dryer crapped out completely. Another 20- to 25-year old device, so we decided to just buy a new efficient unit. Barb did the research on this and decided to buy an [LG dryer]. We designed the laundry room for our electric dryer, but we had a gas line plumbed in “just in case”. Well, “just in case” happened! We couldn’t get an electric LG dryer for at least a week, so we decided to try the gas dryer. I had to make some changes to the gas line coming out of the wall, but after a few trips to the hardware store I managed to get the gas line and a new rigid duct connected to the dryer. 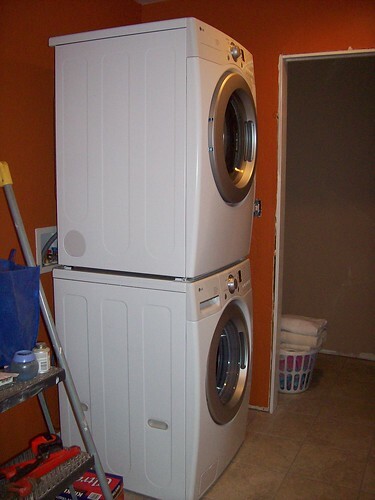 Our washing machine is the same age as the dryer, and it isn’t performing as well as it used to, so we picked up an [LG front loading washer][LG washer] along with a stacking kit so we could put the dryer on top of the washer and reclaim some space in the laundry room. We were a little concerned about the LG washer because of a few negative comments that Barb saw on the web. Most of these claimed the washer was noisy. I noticed that the manual is quite explicit about installing the washing machine perfectly level, especially when installing on a wood-framed (versus concrete slab) floor; otherwise, it’ll make noise that can be heard throughout the house. So I grabbed my 2′ level and asked Barb to keep an eye on the bubble while I adjusted all the feet. It took less than 5 minutes to level the washer, a task made especially easy due to the offset wrench that LG included in the parts bag. I ran a small test load of laundry per the installation instructions, and the only time the washer made *any* vibration noises was right at the beginning of the spin cycle. I’ve got to tell you, this washer is pretty freakin’ amazing! It uses very little water, it’s extremely quiet, the clothes are just barely damp at the end of the wash cycle (so they don’t take very long to dry), and *clean! * Even Caitlin’s socks! (She’s brutal on them, always walking around in socks/no shoes. Being a parent is pretty aggravating sometimes!) We’re using the same detergent etc as before, so I think the change can only be due to the new washing machine. By the way, the best price we found was at Sears. Just one final note–don’t bother with the “venting kit” that they offer. It’s just a piece of flex ducting and an elbow. You’d be better off using rigid ducting, and the parts are cheaper at a hardware store even if you have to buy a pair of tin snips to cut the duct to length. So over the last two months I’ve lost a couple of weekends to non-remodeling “emergencies”. The clock is still ticking on our permit, and I have to call for our final inspection within two weeks. Fortunately I’ve been spending some of my spare time working on the house. I’ve got about half of the windows trimmed out. (What a difference! It really makes a room look finished.) Next week we have the mason coming out to extend our chimney up to the required height; Don and J will pour a concrete pad for our A/C unit and finish a few other things, and José will be out to finish the A/C installation. And I’ve got about a dozen little electrical jobs to finish off. Time to quit blogging and get to work! This entry was posted in Our home remodeling project, Uncategorized and tagged chimney, dryer, electric_car, electric_truck, hvac, laundry, mason, plumbing, tacoma, washer. Bookmark the permalink.